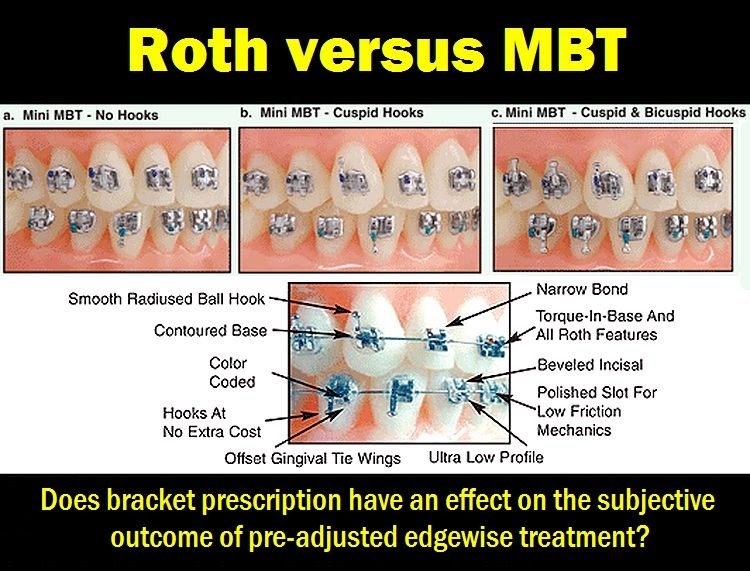 Home / Articles in PDF / Articles of dentistry / MBT / Odontología Virtual / Orthodontics / Roth / PDF: Roth versus MBT: Does bracket prescription have an effect on the subjective outcome of pre-adjusted edgewise treatment? 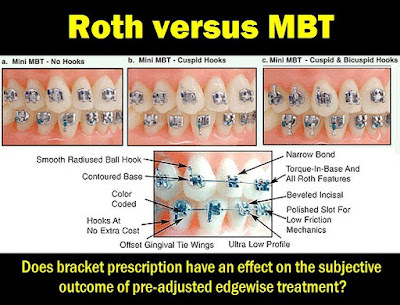 PDF: Roth versus MBT: Does bracket prescription have an effect on the subjective outcome of pre-adjusted edgewise treatment? Since the introduction of the Straight Wire Appliance™ in the 1970s (Andrews, 1979), there have been many suggested modifications to the tip and torque values used in preadjusted edgewise appliances. Many of these changes involve alterations of a few degrees, even though it is known that torque expression in particular is affected by the amount of play between the archwire and the slot (Archambault et al., 2010), differences in the tolerance size of manufactured brackets and archwires (Cash et al., 2004), the method of ligation (Gioka and Eliades, 2004; Badawi et al., 2008), the initial inclination of the teeth (Archambault et al., 2010), additional widening and notching of the bracket slot when placing the larger archwires (Archambault et al., 2010), and even variations in the shape of the labial surface of teeth (Smith et al., 2007).